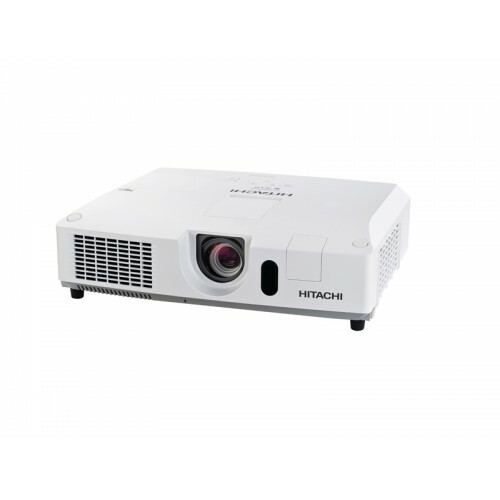 Hitachi CP-X8170 with the brightness of 7000 lumens & having the resolution of 1024x 768 XGA HD LCD video projector is well capable of creating an impact on entertainment & business presentation. The contrast ratio of 3,000: 1 with vertical tilt angle of 360° on 30"~600" display can provide enough clarity & visibility. The UHP lamp with 2,000-25,000 hours of durability requires only 365 W power. This well reputed brand with crestron RoomView technology & enhanced brightness levels ensures greater connectivity with HDMI, 15-pin Mini D-sub, BNC, S-Video, RCA Composite Video, Stereo Mini Jack, RCA Jack(L/R), USB type A & B, RJ-45, IEEE802.11b/g/n (Optional USB wireless adapter is required) for compatibility. This white colored affordable device has a great portability with the weight of 8.7 kg. Experience bright and high-quality images & video in home or business use with 01 year of warranty facility. Star Tech offers the best deals in Rangpur, Chattagram, Dhaka, Sylhet & Rajshahi for Hitachi projectors. Order this heavy duty professional projector from online shop and have the delivery at your convenient location inside Bangladesh.